MSP's Tech Incubator is the ideal place for data science and technology innovation businesses at the beginning of their journey. Located in Manchester Technology Centre, you will have access to MSP's specialist business growth programme and partner networks, as well as high-quality coworking and studio space to help your new business succeed. This purpose built new home is located in the heart of Manchester's Innovation District, the Oxford Road Corridor - home to world-leading knowledge institutions and cultural hotspots. 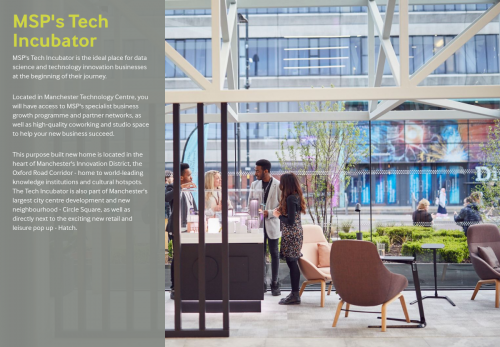 The Tech Incubator is also part of Manchester's largest city centre development and new neighbourhood - Circle Square, as well as directly next to the exciting new retail and leisure pop up - Hatch.